Tomatoes are in the peak of the Summer Season……and every one who thinks of green tomatoes, think that the only way to enjoy them is to fry them…..not so.The acidity of green tomatoes lend themselves to be a perfect addition to a fruit salsa that is not too sweet for the flavors of beef. I had an abundance of green tomatoes in my back yard garden, along with fresh herbs and green onions. I really enjoy this time of year, when you can go to your backyard for really FRESH produce. a black plum, cherries, green Spanish olives, a green tomato, cilantro, balsamic vinegar, green onions, basil, flat leaf parsley,curly parsley , soy sauce, garlic, and Ethiopian pepper sauce. The only thing I had to pick up at the local grocery store was the steak. Some people like flank steak, but I decided on a top round steak with just enough lean. I am pretty sure that you can add red wine vinegar or a good burgundy to the salsa mix, if you do not have any balsamic vinegar on hand. 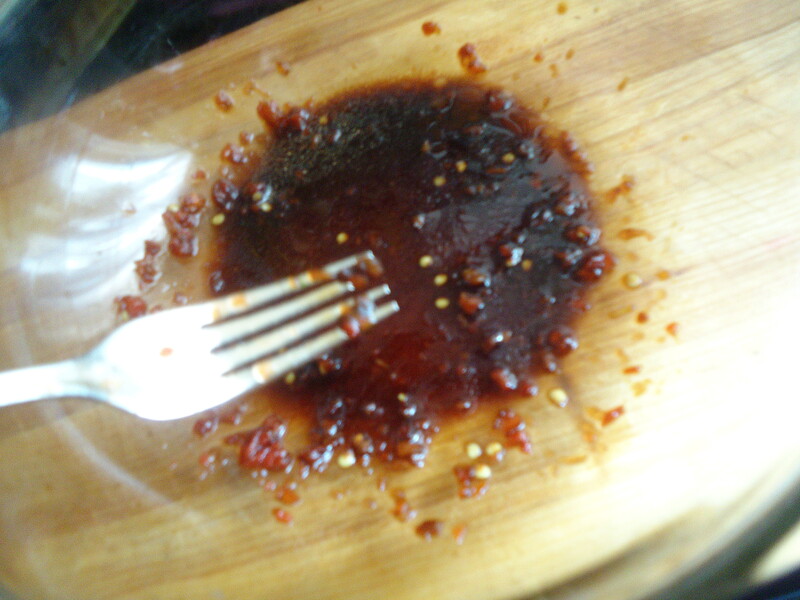 So, I had enough ingredients…..now on with the show………….In a large glass bowl, I add the balsamic vinegar, the garlic and the Ethiopian pepper sauce and mix and I set aside, for the moment. Next, the green tomato was roughly chopped up. The herbs were finely minced and the green onions were thinly sliced. The fruit was prepared, in w hich the cherries were stemmed, pitted and quartered. The black plum was chopped into small chunks. The green tomato, the herbs, the onion, the fruit, and the olives were added to the bowl with the vinegar and Ethiopian pepper sauce. I added salt and pepper to taste and allowed to stand at room temperature. 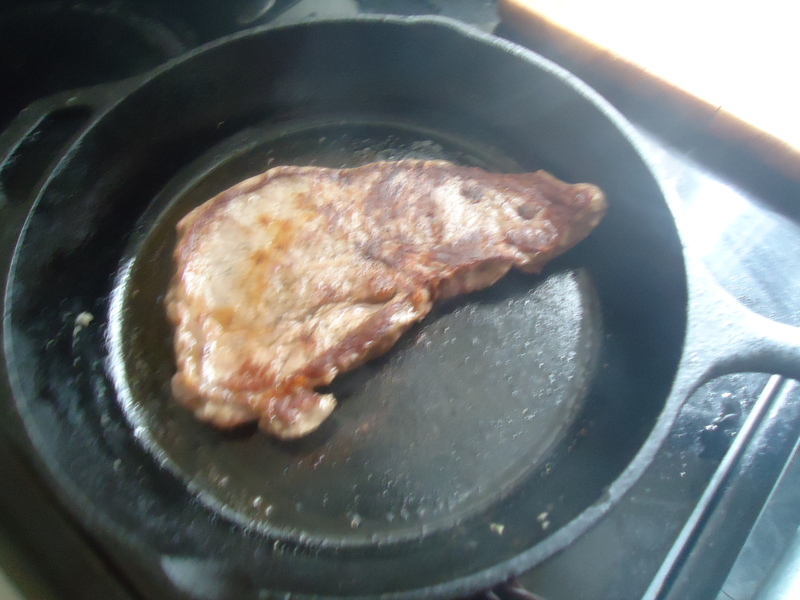 In preparing the steak, I heated a cast iron skillet on high. It is important to have a hot skillet in order to get a perfect sear on the meat. Removing the steak from the packaging , I patted it dry with paper towels. I like my steak simply seasoned, so I sprinkled both sides of the me at with salt and pepper. Adding the steak to the skillet, you can hear the sizzling sound at first contact. I cooked each side for 3 minutes each to achieve medium rare status. 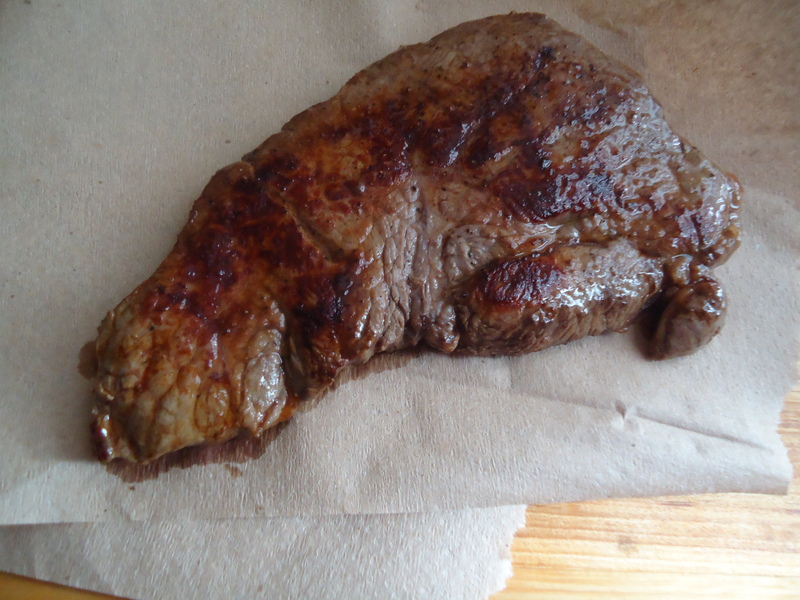 So I removed the steak from the skillet and allowed the meat to rest for 5 minutes. It is really important to allow cooked meat to rest, even if it is chicken, turkey, veal, etc. It allows the natural juices to be retained and prevents the meat from drying out. Slicing the steak on the bias , I fanned it out on the plate. I topped the steak with the green tomato fruit salsa and I enjoyed a perfect summer meal, prepared in less than 20 minutes. And there you have it…….The finished plate………………. 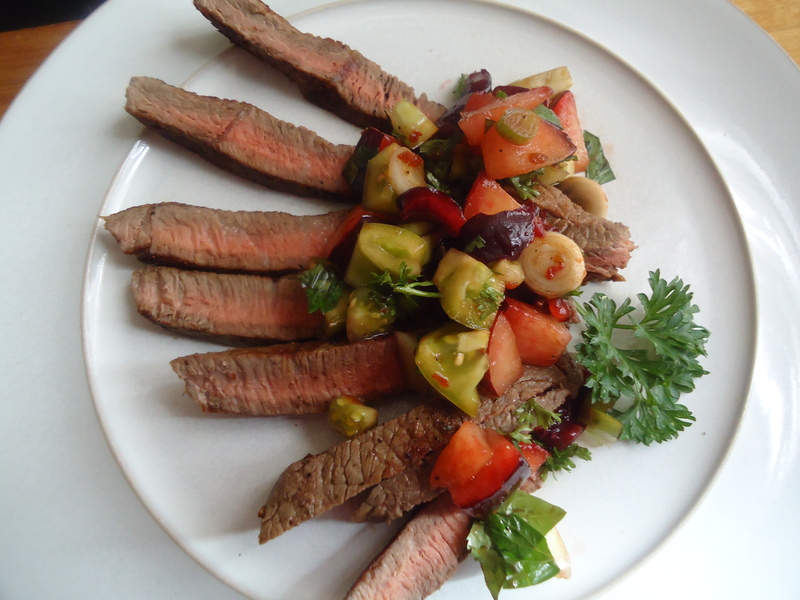 This entry was posted in Main Dishes and tagged Balsamic Vinegar, Basil, Black Plum, Cilantro, Fruit Salsa, Garlic, Green Onios, Green Tomato, Parsley, Red Cherry, Steak. Bookmark the permalink.